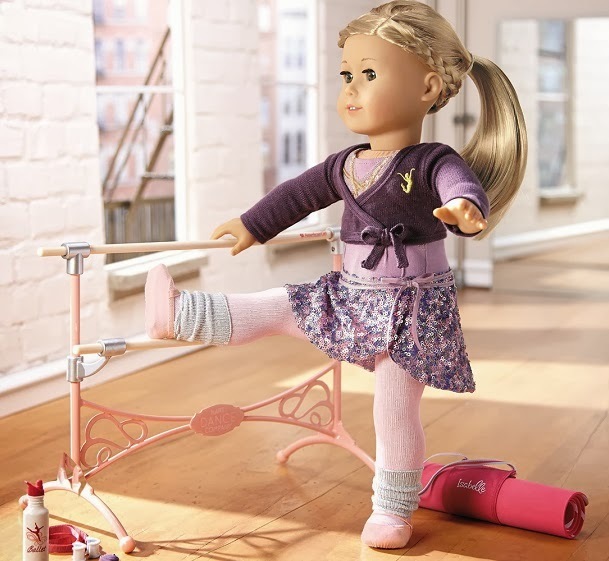 Meet American Girl's 2014 American Girl of the Year, Isabelle Palmer! Isabelle Palmer is 10 years old and is a dancer from Washington D.C. - Isabelle also adores fashion! The 18" Isabelle American Girl doll will come as pictured (see below bottom image - additional accessories pictured not included). 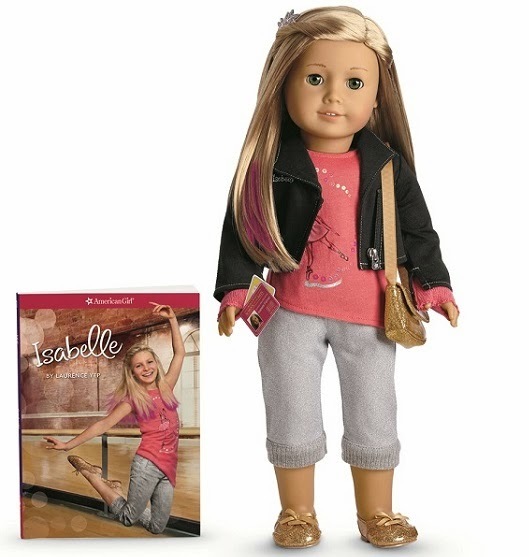 Isabelle has long, straight blond hair with removable pink-tipped highlights and hazel eyes. The outfit that she arrives in includes grey Capri sweatpants, a pink asymmetrical ballerina print graphic tee and gold flats. We are absolutely LOVING all of the furniture and accessories available for this year's "GOTY"(see images below)! We are also loving the "Mix & Match" outfits available for Isabelle. Essentially, the Mix & Match fashion options for this year's Girl of the Year offer the option to purchase various combinations of Isabelle's fashions. All of the Mix & Match fashion options pair nicely to create entirely new looks for your Isabelle doll. Three books will showcase the 2014 American Girl of The Year's storyline. All three titles are authored by Laurence Yep and are illustrated by Laura Kmet. Isabelle (arrives with 18" Isabelle American Girl Doll or available for purchase separately). Description: Isabelle is excited about starting her first year at the Anna Hart School of the Arts. But she can’t help comparing herself to her older sister, Jade, who attends the same school and is an amazing ballerina. Isabelle’s other classmates are equally talented, and she starts wondering whether she really belongs at her new school. She earns a role in the fall festival, but she struggles during rehearsals. Can Isabelle learn how to focus less on those around her and more on her own dancing? With help from her sister and her friends, Isabelle may discover a unique talent that she can truly call her own. Description: As Isabelle rehearses her ballet routine for The Nutcracker, she wonders if she’ll ever master her pirouettes, especially with her classmate Renata pointing out her every mistake. She tries focusing on the other parts of the production she enjoys: exploring the costume and props room and helping out with costumes for some of the younger dancers. But when Jade, her big sister who also attends Anna Hart School of the Arts, becomes moody and withdrawn, Isabelle taps into her design skills to try to find a solution for Jade. In the meantime, can Isabelle find the confidence to tune out Renata and perfect her own performance, too? Description: Isabelle is doing great at the Anna Hart School of the Arts— her dancing idol Jackie Sanchez even invites her to go on tour! Isabelle jumps on board, but she quickly finds that the traveling show has its challenges, not the least of which is bossy Renata who was invited to come, too. When the dance show suddenly starts falling apart, Isabelle tries to help Jackie pull it back together—and begins to learn more about a mentor who encouraged Jackie to dance as a young girl. As Isabelle taps into her talents to try to save the show, she not only discovers who inspired Jackie, but also how she, herself, can inspire those around her. American Girl has also released an App based on the 2014 American Girl of the Year! The Isabelle Dance Studio paid App (available for $0.99) is available for download now! Description: Isabelle is an inspired young dancer living in Washington, D.C. She is excited to begin at Anna Hart School of the Arts where her older sister, Jade, has been studying ballet. Jade and the other girls at school are amazing dancers and Isabelle worries that she won’t be able to keep up! Help Isabelle improve her ballet skills by playing Isabelle Dance Studio. Make Isabelle dance and leap to reach the stars and earn points, and remember—practice makes perfect! Additionally, American Girl is set to release a movie to DVD based on Isabelle's storyline, in the Summer of 2014. The movie was filmed in the Summer of 2013 in Canada and was directed by Vince Marcello (written by Amy Rardin and Jessica O'Toole). Cast for the film includes: Erin Pitt as Isabelle, Grace Davidson as Jade and Devyn Nekoda as Luisa. Try New Moves with Isabelle: Starting January 1, girls can discover their talents at the online version of the Anna Hart School of the Arts at americangirl.com/girloftheyear. Girls can explore the school’s rooms to learn about ballet, fashion design, writing, acting, and more, plus they can unlock exclusive videos and content related to Isabelle and her upcoming movie. Girls who register at Isabelle’s online academy are entered for a chance to win a monthly drawing for an Isabelle doll and book or the Grand Prize—a deluxe trip for four to New York City and tickets to New York City Ballet’s performance of The Nutcracker. Isabelle Learning Guide: A free downloadable curriculum encourages children in grades 3 to 6 to explore and discuss important themes in Isabelle’s stories, such as discovering your own creative inspiration and sharing your talents with others. The Isabelle Learning Guide is available for download at the For Parents and Teachers section on americangirl.com. Keep an eye out for more on the 2014 American Girl of the Year, Isabelle!